Continuous positive airway pressure (CPAP) is the gold standard treatment for moderate to severe obstructive sleep apnoea-hypopnoea syndrome (OSAHS) [1Spicuzza L, Caruso D, Di Maria G. Obstructive sleep apnoea syndrome and its management. Ther Adv Chronic Dis 2015; 6(5): 273-85. [http://dx.doi.org/10.1177/2040622315590318] [PMID: 26336596] -3Gordon P, Sanders MH. Sleep.7: positive airway pressure therapy for obstructive sleep apnoea/hypopnoea syndrome. Thorax 2005; 60(1): 68-75. [http://dx.doi.org/10.1136/thx.2003.007195] [PMID: 15618587] ]. Maintenance of upper airway patency during sleep can also be achieved using a mandibular advancement device (MAD). Prefabricated adjustable thermoplastic MADs (PAT-MADs) are a practical short-term treatment for OSAHS in patients who have failed or refused CPAP therapy [4Banhiran W, Kittiphumwong P, Assanasen P, Chongkolwatana C, Metheetrairut C. Adjustable thermoplastic mandibular advancement device for obstructive sleep apnea: outcomes and practicability. Laryngoscope 2014; 124(10): 2427-32. [http://dx.doi.org/10.1002/lary.24607] [PMID: 24458949] -7Maurer JT, Huber K, Verse T, Hörmann K, Stuck B. A mandibular advancement device for the ENT office to treat obstructive sleep apnea. Otolaryngol Head Neck Surg 2007; 136(2): 231-5. [http://dx.doi.org/10.1016/j.otohns.2006.08.008] [PMID: 17275545] ]. Custom-made MADs have been shown to achieve higher rates of improvement and OSAHS cure than prefabricated MADs due to compliance failure with prefabricated devices, mainly caused by insufficient overnight retention [8Vanderveken OM, Devolder A, Marklund M, et al. Comparison of a custom-made and a thermoplastic oral appliance for the treatment of mild sleep apnea. Am J Respir Crit Care Med 2008; 178(2): 197-202. [http://dx.doi.org/10.1164/rccm.200701-114OC] [PMID: 17673699] , 9Friedman M, Hamilton C, Samuelson CG, et al. Compliance and efficacy of titratable thermoplastic versus custom mandibular advancement devices. Otolaryngol Head Neck Surg 2012; 147(2): 379-86. [http://dx.doi.org/10.1177/0194599812439683] [PMID: 22399278] ]. However custom-made devices have the disadvantage of higher cost [8Vanderveken OM, Devolder A, Marklund M, et al. Comparison of a custom-made and a thermoplastic oral appliance for the treatment of mild sleep apnea. Am J Respir Crit Care Med 2008; 178(2): 197-202. [http://dx.doi.org/10.1164/rccm.200701-114OC] [PMID: 17673699] ] and a delay in treatment while the device is manufactured. Our purpose was to describe the changes in respiratory parameters (apnoea-hypopnoea index (AHI), oxygen desaturation index (ODI)) and Epworth Sleepiness Scale (ESS) in Moroccan patients with OSAHS after treatment with a new retentive PAT-MAD. Twenty-four adults (20 male; mean age 48.6 ± 9.3 years) with mild, moderate or severe OSAHS diagnosed by polysomnography (PSG) and poor compliance or rejection of CPAP were enrolled. Exclusion criteria included: dental syndrome (i.e. propulsion <6 mm), dental/peridontal disease/caries, heavily restored dentition, insufficient number of teeth, temporomandibular joint (TMJ) disorder, significant tooth wear, non-retentive teeth, poor oral hygiene or inadequate mouth opening. As this was a prospective, observational, pilot study a sample size calculation was not performed and we considered that the recruitment of 20 or more patients would give reliable information. The study was approved by the local ethics committee and all patients gave their written informed consent. Each patient was fitted with the PAT-MAD (BluePro®; BlueSom, France; Fig. (1 ) by their dental practitioner Subsequent PAT-MAD adjustments were made by the patient according to the manufacturer’s instructions until snoring ceased or decreased and there was maximum comfortable advancement. 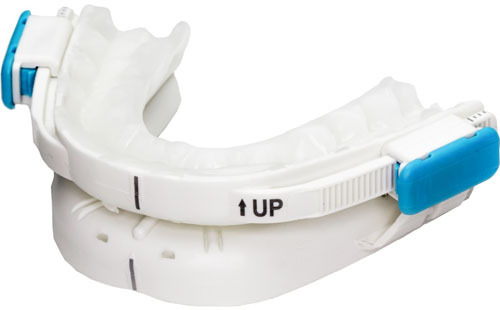 BluePro® prefabricated adjustable thermoplastic mandibular advancement device. AHI score [10American Academy of Sleep Medicine Task Force. Sleep-related breathing disorders in adults: recommendations for syndrome definition and measurement techniques in clinical research. The Report of an American Academy of Sleep Medicine Task Force. Sleep 1999; 22(5): 667-89. [PMID: 10450601] ] for each patient was measured by PSG at inclusion and at the end of the study (EOS). Severity of OSAHS was defined by AHI score as: mild=AHI <15; moderate=AHI 15–29; or severe=AHI ≥30. Successful treatment was defined as a ≥50% reduction in AHI to mild OSAHS, or a reduction in AHI to ≤5/h. ODI score [11Chung F, Liao P, Elsaid H, Islam S, Shapiro CM, Sun Y. Oxygen desaturation index from nocturnal oximetry: a sensitive and specific tool to detect sleep-disordered breathing in surgical patients. Anesth Analg 2012; 114(5): 993-1000. [http://dx.doi.org/10.1213/ANE.0b013e318248f4f5] [PMID: 22366847] ] was also measured at inclusion and EOS by nocturnal oximetry and daytime sleepiness was measured using a patient self-questionnaire and the ESS scale [12Johns MW. A new method for measuring daytime sleepiness: the Epworth sleepiness scale. Sleep 1991; 14(6): 540-5. Five items relating to the efficacy and acceptance of the device (snoring, comfort, TMJ pain, dental pain, satisfaction; each on a scale of 0-10) and five items relating to device use (retention, frequency of use (h/night and nights/week), number of advancements made and acceptance of the device long-term) were also recorded at EOS using a patient self-questionnaire. All adverse events (AEs) that occurred during use of the PAT-MAD were recorded. The demographic and clinical characteristics of the study population at inclusion are shown in Table 1. Demographic and clinical characteristics of the study population fitted with the prefabricated adjustable thermoplastic mandibular advancement device (PAT-MAD). The new PAT-MAD was effective at reducing respiratory parameters in patients with OSAHS, including three with severe disease, when used for a mean time of 106.3 ± 73.4 days, 5.6 ± 1.7 nights/week and 5.4 ± 1.5 h/night. Mean AHI decreased significantly between inclusion and EOS (from 21.4 ± 7.4 to 9.3 ± 4.1; p<0.0001; mean reduction: 57.0 ± 12.3%) Fig. (2A ). Mean ESS also decreased significantly at EOS (from 10.4 ± 2.8 to 7.3 ± 2.3; p=0.0001; mean reduction: 30.3 ± 12.2%) Fig. (2B ). A non-significant reduction in mean ODI was observed at EOS (from 7.0 ± 6.9 to 4.7 ± 4.0%; p=0.2; mean reduction: 30.5 ± 25.0%) Fig. (2C ). Treatment was considered to have been successful in 22 patients (91.7%) who had mild OSAHS or an AHI score of ≤5 at EOS. A mean of 2 ± 1 advancements were made to the PAT-MAD during treatment. Mean scores (± SD) before and after treatment with the PAT-MAD. The success rates in this study are compared favourably with the 65% and 68% success rates reported previously with another PAT-MAD [6Vanderveken OM, Boudewyns AN, Braem MJ, et al. Pilot study of a novel mandibular advancement device for the control of snoring. Acta Otolaryngol 2004; 124(5): 628-33. [http://dx.doi.org/10.1080/00016480310015984] [PMID: 15267184] , 7Maurer JT, Huber K, Verse T, Hörmann K, Stuck B. A mandibular advancement device for the ENT office to treat obstructive sleep apnea. Otolaryngol Head Neck Surg 2007; 136(2): 231-5. [http://dx.doi.org/10.1016/j.otohns.2006.08.008] [PMID: 17275545] ]. No patient in the current study had problems with device retention confirming previous in vitro results which showed that this PAT-MAD possesses sufficient retention forces to resist initial jaw opening and probably full mouth opening [13Braem M. In vitro retention of a new thermoplastic titratable mandibular advancement device. F1000 Res 2015; 4: 56. [PMID: 25901281] ]. The device was well tolerated and only mild AEs were reported (mainly dry mouth (37.5%), toothache (37.5%) and TMJ discomfort (16.7%)). We conclude that this new PAT-MAD may be an effective short-term treatment for OSAHS, particularly in a resource-limited setting where custom-made devices are unavailable to many patients due to cost. Long term studies in a larger number of patients are warranted to assess the long-term efficacy, retention and side-effects of this device. The authors thank Newmed Publishing Services for support with the statistical analyses and writing of this letter. They also thank Dr Bernard Fleury of Saint Antoine Hospital, Paris, France, and Dr Roy Dookun of Cleveland House Dental Practice, Guernsey, for their comments on the final manuscript draft. BlueSom, France, provided the PAT-MADs free of charge. 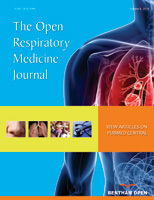 Spicuzza L, Caruso D, Di Maria G. Obstructive sleep apnoea syndrome and its management. Ther Adv Chronic Dis 2015; 6(5): 273-85. Kushida CA, Littner MR, Hirshkowitz M, et al. Practice parameters for the use of continuous and bilevel positive airway pressure devices to treat adult patients with sleep-related breathing disorders. Sleep 2006; 29(3): 375-80. Gordon P, Sanders MH. Sleep.7: positive airway pressure therapy for obstructive sleep apnoea/hypopnoea syndrome. Thorax 2005; 60(1): 68-75. Banhiran W, Kittiphumwong P, Assanasen P, Chongkolwatana C, Metheetrairut C. Adjustable thermoplastic mandibular advancement device for obstructive sleep apnea: outcomes and practicability. Laryngoscope 2014; 124(10): 2427-32. Schönhofer B, Hochban W, Vieregge HJ, Brünig H, Köhler D. Immediate intraoral adaptation of mandibular advancing appliances of thermoplastic material for the treatment of obstructive sleep apnea. Respiration 2000; 67(1): 83-8. Vanderveken OM, Boudewyns AN, Braem MJ, et al. Pilot study of a novel mandibular advancement device for the control of snoring. Acta Otolaryngol 2004; 124(5): 628-33. Maurer JT, Huber K, Verse T, Hörmann K, Stuck B. A mandibular advancement device for the ENT office to treat obstructive sleep apnea. Otolaryngol Head Neck Surg 2007; 136(2): 231-5. Vanderveken OM, Devolder A, Marklund M, et al. Comparison of a custom-made and a thermoplastic oral appliance for the treatment of mild sleep apnea. Am J Respir Crit Care Med 2008; 178(2): 197-202. Friedman M, Hamilton C, Samuelson CG, et al. Compliance and efficacy of titratable thermoplastic versus custom mandibular advancement devices. Otolaryngol Head Neck Surg 2012; 147(2): 379-86. American Academy of Sleep Medicine Task Force. Sleep-related breathing disorders in adults: recommendations for syndrome definition and measurement techniques in clinical research. The Report of an American Academy of Sleep Medicine Task Force. Sleep 1999; 22(5): 667-89. Chung F, Liao P, Elsaid H, Islam S, Shapiro CM, Sun Y. Oxygen desaturation index from nocturnal oximetry: a sensitive and specific tool to detect sleep-disordered breathing in surgical patients. Anesth Analg 2012; 114(5): 993-1000. Johns MW. A new method for measuring daytime sleepiness: the Epworth sleepiness scale. Sleep 1991; 14(6): 540-5. Braem M. In vitro retention of a new thermoplastic titratable mandibular advancement device. F1000 Res 2015; 4: 56.